"FISHING FOR TRUTH is the complex story of the role of science in the decline of the Northern Cod stocks. At issue are conflicting interpretations of recent events, institutional and scientific texts, and scientific data. The central claim of thisd sociologically - informed analysis of the DFO (Department of Fisheries and Oceans) is that all knowledge, including scientific knowledge, is influenced by social propcess. "Truth" is elusive." For anyone immersed in - or just interested in - the fisheries management process, Mr. Finlayson's analysis of the process and the decisions that were central to the current condition of Eastern Canada's cod fishery is must reading. 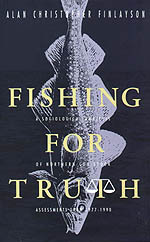 If there is anyone out there who still assumes that the management of our living marine resources is a rational process based on sound and objective science, read Fishing For Truth at the earliest possible opportunity.